Note: Audition date may vary from Steinway Official Website, pending each local Steinway showroom availability. 3. A confirmation message will be sent once a student's complete application has been received, including further instructions on audition procedure and scheduling. • Age requirements apply to applicant's age as of April 1, 2019. Applicants must reside in the United States or Canada. • Students who have participated and won first place in the competition last year may not enter again in the same division. • Students, teachers, parents, and audience members should not approach the judges for any reason during the competition. • Assigned addition slots are final. Rescheduling requests are left to individual showroom's discretion. If a competitor misses theirturn, they will have forfeited their chance to participate (no refunds will be offered). • Judges will be Dale Wheeler; Bruce Vogt and Arthur Rowe. If a change is made, this will be announced by the STEINWAY showroom prior to the competition. 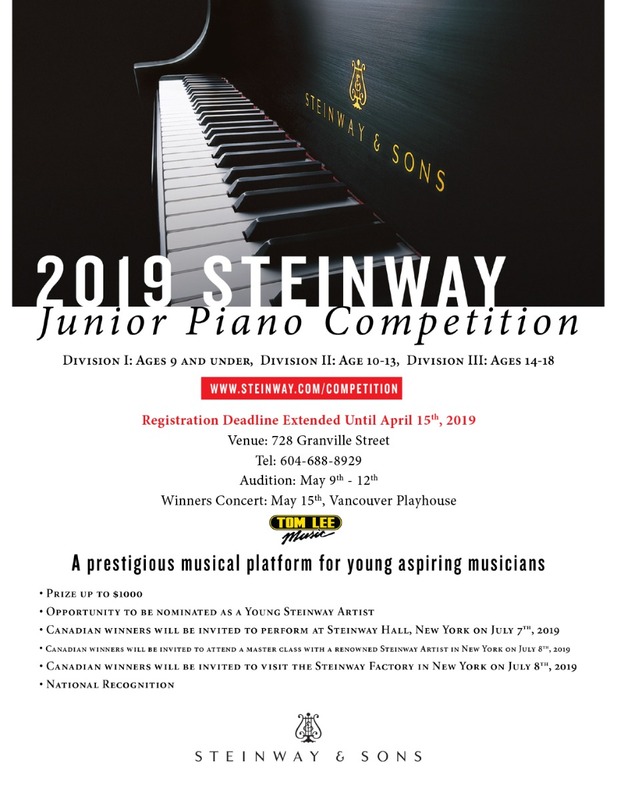 • Close relatives or students who study or have studied with any of the announced judges or Steinway-authorized showroom employees are not eligible to compete. • Students are only allowed to participate at one audition location. • If the student's local authorized STEINWAY showroom is not participating, the student may choose to participate at another participating showroom of their choosing. • Competitors are responsible for their own expenses to participate in the competition, including the cost of their travel. • Contestants should wear their best performance attire. • Qualifying competitors must perform live in order to be considered. • Judges reserve the right to cut off a performance at their discretion. • Evaluations for each round of the competition made by the jury committees are final. Participants and their families and teachers are not allowed to communicate with the judges. STEINWAY & SONS and STEINWAY showrooms reserve the rights to photograph, record, or video the auditions of contestants and winners and to use these documents for marketing purposes. No extra fee will be paid to the contestants. any expenses associated with any prizes, which are not specifically provided for in the official rules. Each winner must provide the Company with valid identification and a valid taxpayer identification number or social security number before any prize will be awarded. STEINWAY & SONS reserves the right to the interpretation of the Terms and Conditions of the Regulations. Two contrasting pieces for solo piano from two different eras of Western classical music including Baroque, Classical, Romantic, and Twentieth Century must be performed memorized. Original compositions and improvisations are not permitted. Repeats may be played at the discretion of the performer, but are not required. In some regions, the judges may need to cut performances off during the audition period. First, second, and third place winners at each Steinway-authorized showroom will receive commemorative medals and national recognition on the STEINWAY & SONS website. All participants will receive a certificate of participation and judges' comments. Dale Wheeler has taught at the post-secondary level for over thirty years and currently teaches piano, theory and history in Red Deer. He holds the doctorate in piano performance and pedagogy from the University of Oklahoma as well as degrees and diplomas from the University of Saskatchewan and Trinity College of Music, London. Dr. Wheeler has appeared as a recitalist, accompanist, adjudicator, and lecturer from coast to coast in Canada and throughout the U.S. He has presented at major conferences throughout North America and Europe, the most recent being the International Society for Music Education 2016 in Glasgow, Scotland. He is a senior examiner, clinician, and consultant for the Royal Conservatory of Music and Frederick Harris Music Publishing. For a number of years Dale was a regular columnist for Clavier magazine and has had articles published in the CFMTA Journal, American Music Teacher, and The Journal of the American Liszt Society. He has recently served as president of both the Red Deer Symphony Orchestra and the Alberta Piano Teachers Association. In 2012 Dr. Wheeler received the Mayor’s Recognition Award for his contribution to the fine and performing arts. When not making music his interest include wake surfing and water skiing, classic cars, and collecting vintage piano recordings. Bruce Vogt appears regularly in concert across Canada, and also inspires audiences abroad, having performed in Japan, China, the U.S., Germany, France, Italy, Norway, Czechoslovakia, Romania and Bulgaria. Vogt grew up in Southern Ontario where he studied with Damjana Bratuz and Anton Kuerti. Later, he studied in the U.S. and Europe with such celebrated musicians as Gyorgy Sebok, Louis Kentner, Fou Ts'Ong and Dario de Rosa. Vogt's repertoire is diverse, encompassing music from the sixteenth century to the present. He has long championed the music of contemporary composers, and commissioned and premiered a number of new works by such Canadian luminaries as Murray Adaskin and Alfred Fisher. He is also a dedicated performer on period instruments; one of his recordings features music of Robert Schumann performed on a restored 1864 Erard. Other recordings include two volumes of the music of Franz Liszt, which have established for him an enviable reputation as a Liszt interpreter. In 2011 – the bicentenary of the composer’s birth – he recorded two subsequent Liszt CDs. In addition to his career as a soloist and chamber musician, Vogt is Professor at the University of Victoria. Because he sees teaching and working with young pianists and teachers as an important commitment, he lectures widely, leads master classes and workshops and adjudicates for festivals. In recent years he been invited more frequently in Canada and abroad to indulge another passion – presenting and improvising accompaniments to great films of the silent era. Canadian pianist and Steinway Artist Arthur Rowe is a critically acclaimed recitalist, soloist with orchestra and chamber musician. Following a New York solo recital, The New York Times wrote: "The Canadian pianist Arthur Rowe made an immediate and positive impression...before eight bars had gone by, one knew he was capable of vigor without heaviness, energy without excess of drive. It was first-rate playing: a kind of execution tinglingly alive to the shape and contribution of each phrase". Reviewing a solo recital in London England, The London Times spoke of his "unusual clarity of articulation", and "poetry of expression", and David Burge, writing in The San Diego Tribune said, "Rowe is a marvelous pianist…even when he is pushed to the limit by extreme virtuosic demands...he can concentrate all of his considerable talents on vital matters of phrasing, tone and ensemble". Arthur Rowe has been heard regularly on radio broadcasts in Canada and the United States, and has recorded with various artists for the Crystal, ebs, Innova, GM and Fanfare labels. In 2007, he released an all Schubert recording on the Centaur label (available on iTunes). Fanfare magazine’s review says, “Rowe’s reading (of the posthumous B flat Sonata) is one of the most beautiful I have heard… The D. 899 Impromptus are equally impressive…his purling right-hand runs recall Schnabel’s velvety sound…. every harmonic change is underscored by a delicate nuance of color change. This kind of expression cannot be taught; it is in the bloodstream and the soul." A highly respected chamber musician, Mr. Rowe regularly collaborates with artists and chamber ensembles across North America. He has been a guest artist at summer festivals in Blossom, Interlochen, Niagara, Santa Fe and Seattle, as well as in France, New Zealand, and Yugoslavia. While at Indiana University, he began his long association with violinist William Preucil, Concertmaster of The Cleveland Orchestra, with whom he has concertized for almost four decades. In 2004 The Harrington String Quartet joined forces with Arthur Rowe and William Preucil in New York for a performance of the Chausson Concerto for Violin, Piano and String Quartet, which was reviewed by Harris Goldsmith as a "reading that rivaled the benchmark recordings by Franzescatti/Casadesus/Pascal, and Heifetz/Sanroma/New Arts”. Mr. Rowe has recently performed with the Dover Quartet, and the Cecilia Quartet, both recent winners of the Banff International String Quartet competition. Upcoming performances in 2016/17 include recitals with William Preucil, Concertmaster of the Cleveland Orchestra, Vancouver’s Vetta Ensemble, and Toronto based Mezzo-soprano Krisztina Szabo. Having previously held positions at the University of Iowa and the University of Western Ontario, Arthur Rowe resides in Victoria, where he is Professor of Piano at the University of Victoria and the Artistic Director of the Victoria Summer Music Festival.